To be considered for IRI's New Product Pacesetters, IRI starts tracking a product once it reaches 30 percent of national market penetration. "Multi-outlet geography" for IRI means grocery, drug, mass, dollar, club and convenience channels, including Walmart, Sam's and BJ's club stores and military commissaries. The product must complete a full year of sales in calendar 2012. In a year in which Greek yogurt hit full stride, Dannon Co., arguably a latecomer to that market niche, had the biggest-selling new product of 2012. Another breakfast product aimed at another new niche, Starbucks K-Cups, was a distant but significant second. Dannon Oikos sold $283.8 million in first-year sales and the Starbucks pods for the popular Keurig coffee makers recorded $198.9 million in year-one sales. Bud Light Platinum – no comment on its applicability to breakfast – hit $162.2 million. All that is according to Information Resources Inc. and its annual New Product Pacesetters report, which was released at the Chicago market data firm's annual IRI Summit in April. See the sidebar for the full list. It's always difficult, for IRI and us, to throw a ring around this group, but we see a lot of novelty in there (frozen cocktails in pouches, water-flavoring drops, self-inflating popcorn bowls, K-cups and – are you tired of it yet? – Greek yogurt). "Behaviors displayed by many of today's shoppers reflect the economy at large: feeling more optimistic about their prospects, but holding onto the frugal mindsets and practices left over from the recession," says Larry Levin, IRI's executive vice president and general manager-Insights and Thought Leadership. "This year's New Product Pacesetters results bring these seemingly contradictory behaviors to life and demonstrate the power that consumer-centric innovation has in driving revenue growth for CPG marketers. "It is not surprising that consumers continue on a relentless pursuit for value. They simply have no money to waste on products that do not provide value," he continues. "It's critical for CPG marketers to understand, though, that value does not necessarily mean cheap. In the end, value means different things to different consumers, and it means different things across different categories. But, a fair summary of value is a product that effectively meets consumers' needs at a reasonable price tag. Simply, a product that does something to enrich one's life." In 2011-2012, the era when these 2012 Pacesetters would have been born, nearly 1,900 new consumer packaged goods (CPG) brands hit retail shelves across the U.S. multi-outlet geography, which includes traditional grocery, drug and mass market retailers, as well as sales from dollar and club channels, Walmart and military commissaries, the report begins. "Only 11 percent of those launches met the stringent, industry-recognized benchmarks of exceptional first-year sales success required to achieve 2012 New Product Pacesetter status." The 200 top-selling CPG launches of the year, which make up IRI's broader definition of New Product Pacesetters, each captured more than $13 million in year-one sales, with an individual average of $39.5 million in first-year revenues. Food and beverage products did a little better, averaging year-one sales (for the top-100 brands) of $43.4 million. "New food and beverage brands addressed long-standing trends around wellness, indulgence and convenience," the report says. "Importantly, though, the most powerful launches of the year also delivered more to today's finicky, frugal and fast-moving consumers. They provide new options that serve cross-occasion eating behaviors, support proactive wellness efforts and satisfy desires for intelligent indulgence." "IRI's 2012 Pacesetters are best-in-class products that have truly beaten the daunting new product odds," says Levin. "In fact, the manufacturers of these Pacesetter brands showed a quiet resolve and determination to stimulate growth despite a challenging economic environment in 2012." IRI also creates an annual list of "rising stars," who are early-on favorites to appear on next year's list (see Figure 3). Interestingly, Top 10 finishers Oikos, Starbucks K-Cups, TruMoo, MiO and Sparkling ICE were on that list. So were Healthy Choice Top Chef Café Steamers, Nabisco Newtons Fruit Thins and Skinny Cow candies, which did not make the top 10. Dr Pepper Ten and Magnum novelties were on the rising stars list, too, but did place on the following convenience store list. IRI broke out figures for new products sold in convenience stores. New products in this category did even better than the previously mentioned categories, attaining an average of $50.4 million in year-one sale. Far and away, the leader in the convenience stores category was Bud Light Platinum, with year-one revenue of $224.5 million. (Yes, that would give Platinum combined sales of $386 million.) Other new brands from the traditional store category also did well in C-stores, with No. 4 TruMoo adding $95.7 million to its total and No. 6 MiO collecting another $30 million. Top-10 finishers in C-stores that did not place in the traditional store category were Monster Rehab ($161.4 million), Lipton 100% Natural ($60.1 million), Reese's Minis ($39.8 million), Dr Pepper Ten ($28.9 million), Rockstar 2X ($20.9 million) and Magnum ($19.8 million). "The power of trends around wellness and the quest for foods that support nutritional goals are immense. The top-selling launches in the convenience-store channel really underscore this phenomenon," continues Levin. "Even in the convenience-store channel, where indulgence is often toward the top of consumers' minds, healthier-for-you innovation is being well received." This 2012-based list continues a trend IRI has been eyeing: that average year-one sales by new CPG brands have been decreasing for several years. "The shift underscores an important evolution of CPG innovation — new products are becoming more targeted," IRI concludes. In 2012, 68 percent of new CPG launches accrued less than $7.5 million in year-one sales. This figure was slightly higher (75 percent) across non-food introductions and slightly less (58 percent) across new food and beverage introductions. "Beauty and personal care manufacturers are catering specifically to men, healthcare manufacturers are wrapping in ingredients that support everything from bone health to cardiovascular health, and food manufacturers are delivering foods free from gluten and/or packed with antioxidants," IRI explains. "The degree of targeted innovation available in today's market is made possible by a number of factors, including advances in technology and the discovery of new ingredients. But, the knowledge on which these innovations are based is the result of revolutionary changes in marketers' ability to harness a variety of disparate pools of data and integrate them." Another trend noted is the increasing reliance on brand extensions. "Manufacturers continue to leverage the power of their iconic brands to drive their innovation efforts," the report says. "The vast majority of new product introductions in 2011-2012 were extensions of existing brands. This, after all, is a shorter, less costly path to innovation, and it is generally less risky. "But, it is also a path that typically leads to a smaller sales boost. 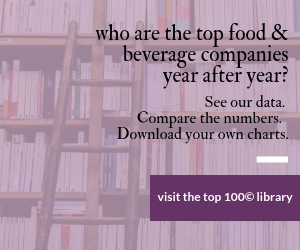 During the past decade, food and beverage introductions [of new brands] yielded an average 9 percent more in year-one sales versus brand extensions. In 2012, the difference is +32 percent, with net new brands commanding $54.3 million versus $41.0 million for new brand extensions." Yet another observation: "The resurgence of home-based eating has been a hallmark of the economic downturn." That's certainly reflective in the K-cups, MiO and the Orville Redenbacher pop-up bowl, and perhaps also goes for the Daily's frozen drinks. "The class of 2012 IRI New Product Pacesetters is remarkable for many reasons," concludes Susan Viamari, editor of IRI's Times and Trends newsletter. "These products are bringing consumers increased value at a time when value is more critical than it has been in recent history. They are doing this by harnessing many and varied ingredients and technologies to deliver products that do things better with less effort; taste better, with enhanced nutritional value; and bring excitement, without breaking the bank. These products are leading the CPG industry into tomorrow. And, they are delivering growth for the manufacturers that bring them to market."